Known as much for its majestic beauty as for the fact that it’s one of the biggest protected areas in the Eastern U.S. for black bears, Great Smoky Mountains National Park is a revered place for campers to test their mettle while surrounded by breathtaking natural beauty. Encompassing more than 522,000 acres across Tennessee and North Carolina, with 16 mountain peaks exceeding 6,000 feet in elevation, the behemoth park is a naturalist’s playground. With 730 miles of fish-bearing streams, 850 miles of backcountry trails, more than 100 backcountry campsites, and 1,000 additional campsites on developed grounds, there is no shortage of things to do. If you want to experience the glory of the mountains without the commitment of camping, there’s only one lodge in the entire park—LeConte Lodge. 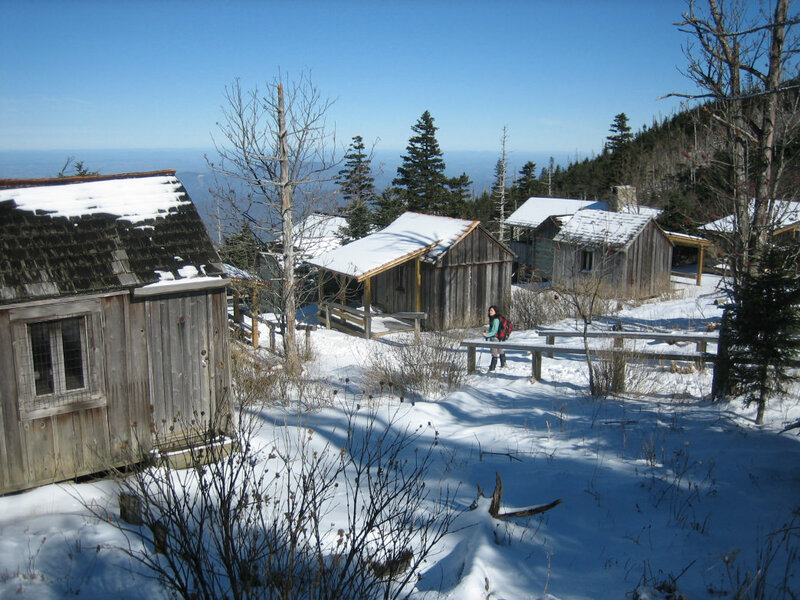 Nestled into a glade about 6,400 feet up, just below the peak of Mount LeConte, the lodge is the highest guest lodge in the east. Closed until November 2016 for trail restoration, the already-in-demand accommodations will be a hot ticket once they’re accessible. Book early, or consider frontcountry camping on one of the more popular, newbie-friendly campgrounds in the park. 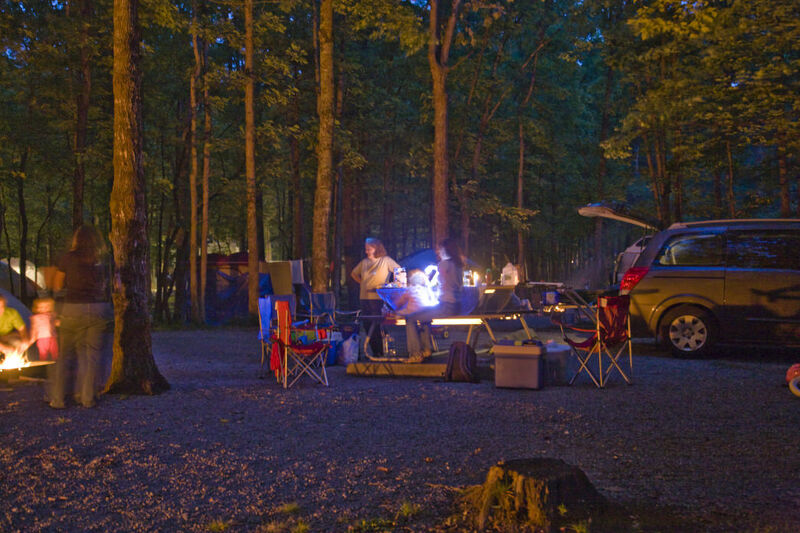 For the uninitiated or casual camper, the Smokies are still a good time. Designated as both an International Biosphere Reserve and a World Heritage Site, the park is a postcard portrait waiting to happen every direction you look. And that’s not hyperbole—in fact, its stunning views are the biggest reason that Great Smoky Mountain National Park has more annual visitors than the Grand Canyon and Yosemite combined (in most years). In other words, a first-time camper in the Smoky Mountains is a lucky camper indeed. Summer is high season here, so reserve your site well in advance. 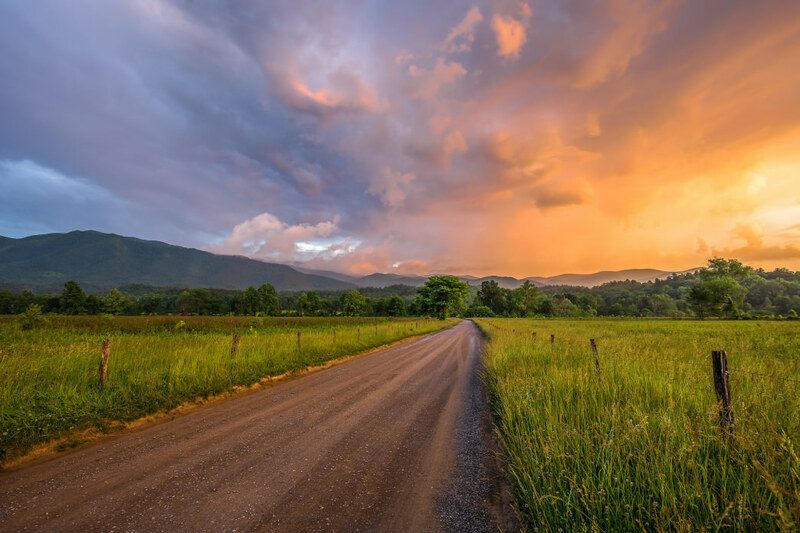 Best bets include the well-populated Cades Cove campground near Thunderhead Mountain and, for a little more peace and quiet, the more secluded Cosby campground near Mount Cammerer offers the silence of solitude and the convenience of a road nearby. One of Cades Cove’s unique treasures is its grist mills, which are still in working order today. You can even buy fresh milled cornmeal at a nearby shop. Another fun thing to do at Cades Cove is a summer hayride, running from June to mid-August, and picking back up again later in the fall. Cosby’s charm, on the other hand, lies is in its abundance of wildflowers and its air of seclusion. Not to mention that it’s a bit off the beaten path, making it feel like a secret paradise. 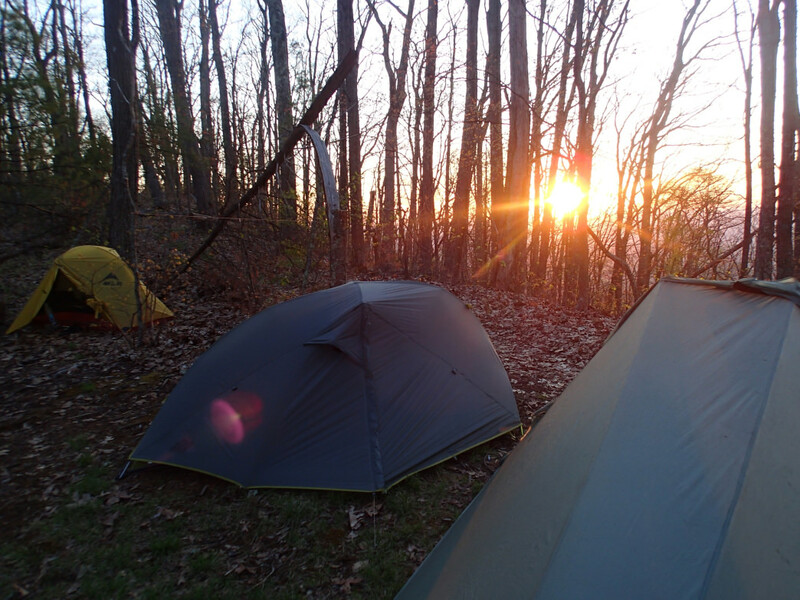 For the past several years, Great Smoky Mountains National Park has required both a permit and advance reservations for all backcountry camping within the park, so first and foremost, make sure everything in order before you pack. Permits are $4 per night per person and can be obtained up to 30 days prior to the first night of your trip. The park’s Backcountry Information Office has put together a helpful page with all the guidelines, regulations and information you’ll need for your stay—highlights include best practices for camping in bear country, and a point-by-point rundown of the Leave No Trace policy. Backcountry campers are prohibited from staying in one campsite for more than three consecutive days, and parties are limited to eight people, with special permits occasionally granted in advance for up to a dozen. While many maps of the park show its backcountry as being flat, that’s not the case, so before you go, be sure to do your research and know your terrain. Unfortunately, cell phones are essentially bricks in most parts of the backcountry, and GPS can’t always be relied upon. So, keep a paper copy of the park’s official backcountry trail map with you at all times. In an emergency situation, help can take days to get to you depending on where you are, so knowing your location and being able to relay it is critical. It’s also important to have a working knowledge of first aid as well. 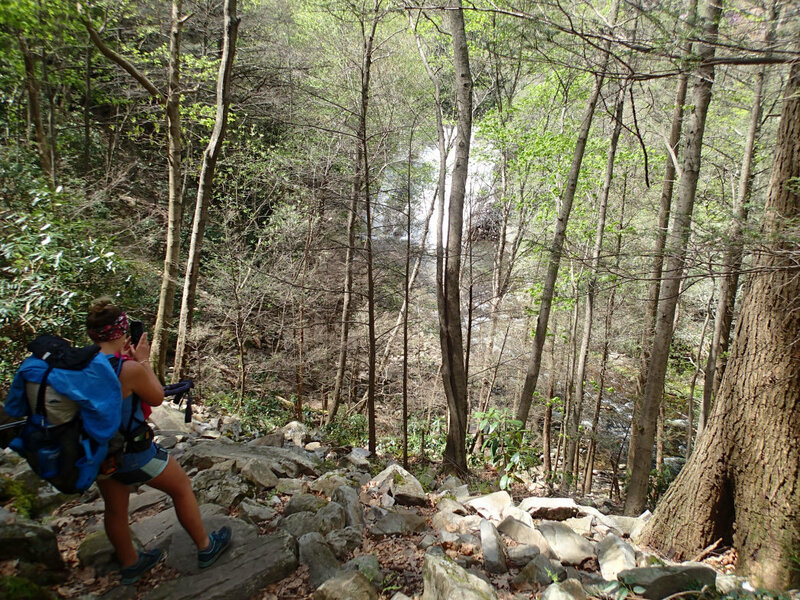 If you’re an experienced backcountry camper, but have yet to experience the wonder of the Smokies, you’re in for all sorts of treats. If you can hike 10 to 12 miles a day, a trek through the park should take about a week. At a more leisurely pace, more time is needed of course. Trail shelters are threadbare and often only partially enclosed, so plan accordingly when you pack. The charms of wilderness camping here are immense, however, so know that roughing it has its rewards. Whether you’re testing your capability in relative wilderness for the first time ever or are a veteran backpacker ready to explore undiscovered parts of your favorite park, there’s a wealth of official information to keep you up to date on everything from weather conditions and road closures to the latest park news. The Smokies have an official app which you can download to your phone or tablet, as well as a newsletter that comes out once per quarter. And of course, the park's website is the most reliable place on the web for official information about the park all year round, so when you’re planning your trip, be sure to visit it often.